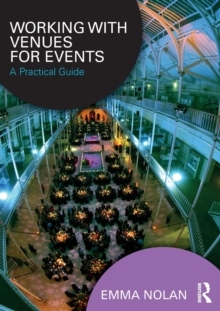 This is a book for aspiring event managers, providing both a theoretical and a practical guide to selecting and working with venues as part of the event planning process. The book explores the different types of venues available to event managers, from unique venues such as historical buildings and theatres to sporting and academic venues, analysing the specific characteristics, benefits and drawbacks that distinguish them. It also illustrates how venues function and are managed, incorporating key aspects of venue management including staffing, marketing, legislation, production, scheduling and administration. Sustainability, ethics and technology are also integrated throughout, along with a vast range of industry examples of different venue types and events from around the world. Comprehensive and accessible, Working with Venues for Events offers students an essential understanding of how event managers can successfully negotiate, work with and plan for a successful event in a variety of venue settings. This is an invaluable resource for anyone with an interest in events management.